By now you’ve hopefully seen Juno; it’s a wonderful film with a sharp script and well drawn characters. It uses music beautifully, too. Rather than simply whacking it down as a thudding backbeat to some flash images (CSI), or using overfamiliar tunes to prop up dead scenes, the team behind Juno make the music integral to the shots it plays over. It’s distinctive, too – rather than the familiar grab-bag of orchestral/rock/pop/mulch that many films opt for – it’s generally acoustic, scratchy, and on the surface at least, quite twee. The opening in particular, uses a tune by Barry Louis Polisar that’s extremely… sunny… as you can see from this YouTube clip of the film’s beginning. 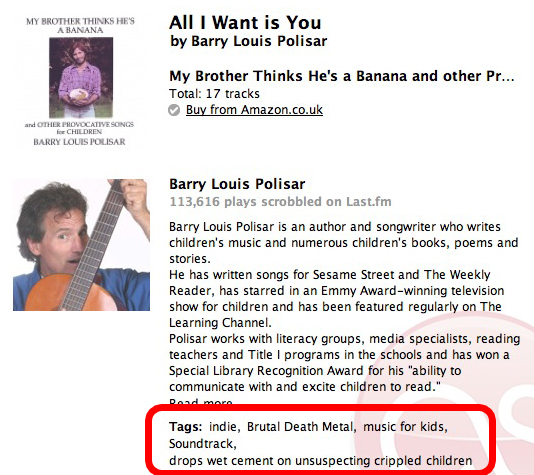 While playing the soundtrack, I looked up some info through the Last.FM app – and found some pretty funny tags hanging around Mr Polisar, as you can see from the screenshot above. Title and artists for a mixtape, right there people. 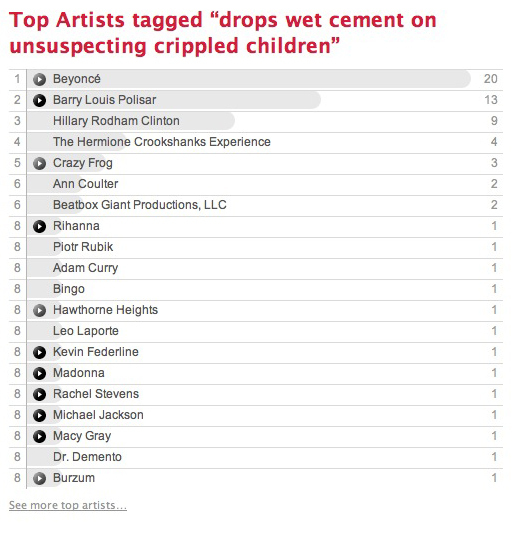 I actually think this is quite a cool use of tagging – just as we’ve seen users on Flickr using somewhat abstract, emotional terms to describe their pictures, Last.FM users are using tags for opinions/reviews/jokes. Just goes to show how complex a field search is, I think – plain text search is fine, but more often than not, people plot links to things based on far more intangible criteria. This entry was posted in Creativity, Digital Products. Bookmark the permalink.